This title uses a creative lens to make the topic of clean energy both enlightening and entertaining. Gary Schwendiman’s The Future of Clean Energy is a creatively written, cleverly constructed, and well-reasoned argument supporting two sources of “clean” energy. With all of the media attention surrounding energy use, it is almost an impossibility to address the topic of energy in a new and different way. Schwendiman, cofounder of a private equity firm that invests in clean energy, manages to do that here, using the novel approach of likening the primary sources of energy to professional football teams. The author goes even further, dividing the teams into two “conferences,” the “Electricity Conference” and the “Fuel Conference,” which face each other in the “Clean Energy Bowl.” This very inventive idea allows Schwendiman to evaluate the pros and cons of each energy source while making his book highly engaging. 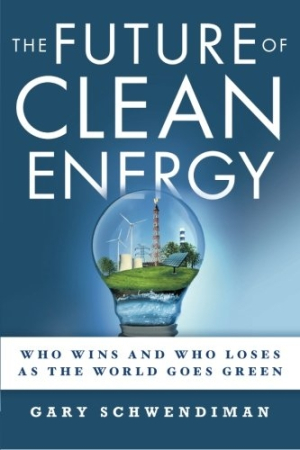 The book begins with an important definition of “clean” energy which, writes the author, consists of two main factors of an energy source: “(1) its ability to reduce particulate pollution and the emission of greenhouse gases, and (2) its positive impact on the world economy.” With this definition as the guiding principle of the book, the author identifies each of the primary energy sources he will discuss: Team Coal, Team Geothermal, Team Natural Gas, Team Nuclear, Team Solar, Team Water, and Team Wind (Electricity Conference) and Team Gasoline and Team Ethanol (Fuel Conference). Every one of these “teams” is covered in a fair amount of detail, but the book’s real value is that it is comparative in nature. Rather than learning about each of the teams in isolation, the reader is exposed to their relationship to one another through such key concepts as economic viability, cost per household, transmission/storage, reliability, and environmental impact. The bulk of the book concentrates on the energy sources Schwendiman chooses as each of the conference winners, Team Nuclear in the Electricity Conference, and Team Ethanol in the Fuel Conference. The author examines these two teams in considerable depth; perhaps most interesting, though, are the facts he employs to dispel common myths about both nuclear energy and ethanol. Schwendiman’s personal knowledge base of these areas is impressive, as is his utilization of extensive research-based references to support his case for selecting these teams. At the end, there is a winner of the Clean Energy Bowl, but one needs to read the book to find out which team is victorious. Whether one agrees or disagrees with the author’s conclusions, it is likely the reader of The Future of Clean Energy will come away with an enlightened view of a complex subject. With his ability to write in simple terms and use an analogy that brings energy down to a level every consumer can understand, Schwendiman makes the topic of clean energy both educational and entertaining.